OK, you have a turntable, but how do you know how it is performing? A very common and often overlooked problem, but here we have everything you need. If we have missed anything, please let us know. A tiny and very easy to use gauge made out of pure aluminium. You may not be able to set to 0.0001gm, but you will know that it is accurate ! This will keep your stylus clean. Remarkably, even extremely expensive cartridge manufacturers recommend the Audio Technica AT607. It comes in a bottle with a cleaning brush, nothing else needed. It is made in Japan to extremely strict standards. 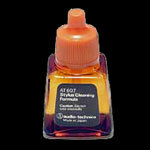 We use this at shows about every hour to clean the stylus, absolutely essential ! It has been known to all those concerned with high end audio for many years now that by removing electrostatic charge from records and CD's improvement in sound quality can be realised. But until now removing electrostatic charge has always been a costly exercise, both in time and money. Developed by SFC of Japan, the patented electrostatic brush SK-II has arrived brought to you by Furutech. This revolutionary product, so simple to use, will change your listening for good. Experience the product that has become such a great hit among Japanese high-end audio fans. How it is made: Natural Goats hair surrounded by thicker strengthening acrylic fibers. Only the natural fine goat hair is exposed to any disk media and will not damage or mark in any way. By using electrically conductive acrylic fibers that have been coated with copper sulphide and binding them together with a metal band, when both sides of the metal band are held during use, a corona discharge results; thereby removing static charge from media and charged dust particles. The acrylic fibers have been set back 15mm from the tip of the brush and their chemical coating absorbs positively charged copper ions. The structure of these electrically conductive acrylic fibers (40 denier, thickness 69.3 microns) is patented (#1677237). We were sceptical about this, very sceptical! But it works and we use one every single time we play a record and so should you. Pure and simple, no stainless steel or gold, a simple sprit level. So tiny it can rest on the headshell to make sure your headshell and arm are correctly set up. Quite essential. Carbon fibre. Effortlessly removes unwanted dust, dirt, or small particles from your vinyl records, whilst effectively reducing any static charges. This pulls dirt out of your records unlike some velvet cleaners that push it to the bottom of the groove! This is the superior Clearaudio one. This is the best there is, running at 300Hz you get much better accuracy than 50 or 60hz strobes. The disc has groves in it, so you can put the cartridge on the strobe disc and set the speed under loaded conditions. We use one on everything we sell. If you want the best, you have to own this set. We think this is the ultimate strobe, arguably better than the Clearaudio. Mat 1: A black elastomer "donut" on top of the white full-size foam base reduces vinyl/stylus feedback and eliminates lateral slippage, while drawing static electricity away from the record. 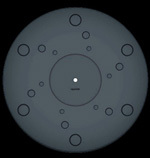 Unique qualities allow the vinyl to "give" slightly with stylus contact, allowing the record groove to be tracked smoothly and accurately. Completely non-tacky, records lift right off the mat, while the underlying foam sticks firmly to the platter. This 3.7mm thick mat virtually eliminates the effect of platters that can be prone to ring. Mat 3: The original turntable mat, Oyaide “MJ-12”, is designed to trace the groove on the vinyl absolutely. The surface of MJ-12 is curved 1.0 degree which makes the record surface closely fit to MJ-12 by using a stabilizer (more than 300g is recommended). This corrects the warpage of an analogue record and makes the stylus moving stable. Oyaide “MJ-12” £499.00 and UK postage free. Mat 5: Inheriting the shape of MJ-12 above, it is made of butyl rubber which has excellent vibration damping properties. Due to its high friction coefficient and grippy material, it enhances the adhesion with the vinyl surface and ensures stable vinyl playbacks by its anti-slip property. Tungsten, which has almost same specific weight with gold and known as anti-vibration material, is mixed into butyl rubber which has excellent low-repulsion force and vibration absorbing property. The tapered structure angled 1.0° from centre circle to the edge for correction of warping. 18 of tuning holes are arranged in spiral pattern for effective vibration attenuation. It comes with a really rather nice Stroboscopic disc and overhang gauge too. This is for the diehard purist. You can set up any arm and any cartridge. A thing for the enthusiast only. We use one to set up every turntable we do. It's very simple unlike some! £185.00 If you want the best, you have to have this! A soft copper Cartridge Stabiliser that adds mass to your arm allowing the better use of the Denon DL-103 series when using normal headshells. 7.8g (3mm thick) and 3.1g (1.2mm thick) available, so you can have 3.1, 6.2, 7.8, 10.9, 14.0 and 15.6g. 1 off £24.95, 2 off £34.95, 3 off £44.95 free UK postage. These are long arm ball ended allen keys. They allow you to tighten up screws even if you can't get the key straight into the hole. They are essential to fit most tonearms, without them you may simply be unable to secure your new tonearm properly. Included is the elusive 1.27 essential for Linn and other arms, B&Q/Homebase do not stock these! Sizes are 1.27, 1.5, 2, 2.5, 3, 3.5, 4, 5, 5.5, 6, 7, 8, and 10mm.